One week, it’s a vast desert revealing zero signs of any kind of life, with swirling dust storms and temperatures ranging from 100 to 40 degrees daily, where the sunrises and sunsets are so dramatic you’d think you were on another planet. The next week, it’s not only a thriving city of 60,000 people, but literally the most happening scene in the world, and that’s a gross understatement. The next week, it’s not only a desert with zero signs of life once again, but leaving no trace of a single person ever being there. This is Burning Man, an annual crowdsourced community centered around the arts and creativity. 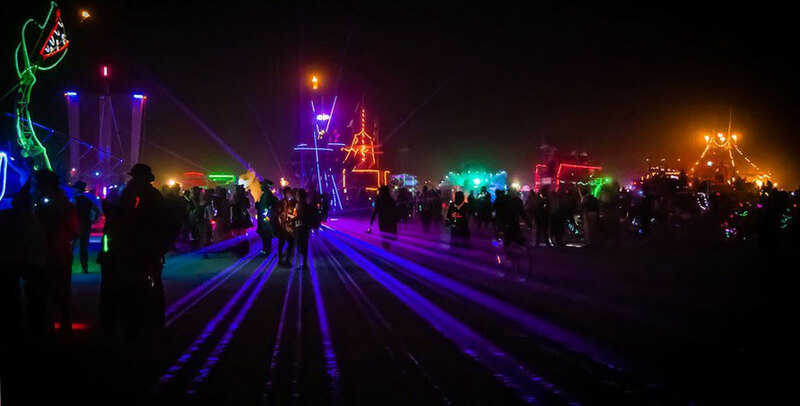 Many who have never been think of it as, “Oh, that crazy hippie thing with the drugs and naked people.” However, for those who have actually been to Burning Man, that’s like describing the internet as “Oh, that crazy techy thing with the poking and naked people”. Everyone is biking or walking. There are no moving cars, except for art cars; extraordinary sculptures of artistic and musical wonder moving no faster than 5 mph and serving as mass transit. Not only are there no chain businesses or ads, nor a single logo on a t-shirt, but instead hundreds of venues are serving cold drinks, meals, services and classes for free, with no barter expected. In the days and evenings, myriad shows, performances and events provide free entertainment. Throughout the night there are several dozen venues providing world class music, with no cover charge, no dance code. Pervasive through the week is a tacit agreement among everyone to reserve judgment, be accepting, and embracing each individual’s uniqueness. You just don’t see any arguments in the public areas, mostly smiles and lively conversation. Radical Inclusion. Anyone may be a part of Burning Man. Gifting. Burning Man is devoted to acts of unconditional gift giving. Decommodification. No commercial sponsorships, transactions, or advertising. Radical Self-reliance. Individuals are encouraged to discover, exercise and rely on his or her inner resources. Radical Self-expression. Expression of the unique gifts of the individual. Communal Effort. Emphasis on creative cooperation, collaboration and interaction. Civic Responsibility. Responsibility for the public welfare and adherence to local, state and federal laws. Leaving No Trace. A commitment to leave places in a better state than when found. Participation. Transformative change can occur only through the medium of deeply personal participation. Immediacy. This is the underlying principle of Burning Man, that there is no substitute for the present experience, whether that’s building a pop-up city, gifting an experience, or joining an intriguing conversation. Radical Inclusion. Everyone should be allowed to shape a city, not just those with the most influence. Gifting. Gifting is an extension of self expression, and local businesses are the closest you’ll find to that when it comes to commerce. Also, anything that extends a ‘random acts of kindness’ mindset. Decommodification. Having no commercial sponsorships, transactions, or advertising may be too radical for a year-round community, but again, emphasizing local business over chains goes a long way toward achieving this principle. Radical Self-reliance. Walk instead of drive. Grow more of your own food. Use local energy. Radical Self-expression. Consider being an entrepreneur or a 9 to 5 that you’re intrinsically passionate about. Get involved in a crowdsourced placemaking program to shape your neighborhood and city. Communal Effort. Emphasis on creative cooperation, collaboration and interaction. This is the same wherever you are. Civic Responsibility. Responsibility for the public welfare and adherence to local, state and federal laws. Same again. Leaving No Trace. A commitment to sustainability. Green buildings. Renewable energy. Local reliance. Participation. Transformative change can occur only through the medium of deeply personal participation. The same wherever you are. Immediacy. This is the underlying principle of change in any community, to get involved now, not tomorrow or next week, or when the time is just right. Pop-up venues and experiences are a practical application of immediacy when it comes to placemaking. Looking to apply the ten principles in your community? Check out the Burning Man Project that was created last year just for this purpose, and see how Zappos founder Tony Hsieh committed $350 million of his own money to bring this to downtown Las Vegas via The Downtown Project after experiencing Burning Man himself. Much more to come.